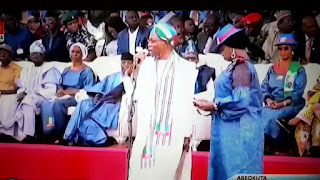 This is the moment the wife of Ogun State Governor, Olufunso Amosun held his agbada and calmed him down from going to attack Ex-Governor Rauf Aregbesola who shaded him during APC campaign rally in Ogun State. Recall that after the internal APC crisis in Ogun State, Governor Ibikunle Amosun created another party called Allied People’s Movement (APM) that he is supporting for governorship in the state while still supporting APC at the National level. However, when ex-governor of Osun State, Rauf Aregbesola was addressing the people in yoruba, he said they should vote the APC governorship candidate and not Amosun’s APM governorship candidate, a statement that did not go down well with Governor Amosun. The APC Ogun campaign rally was broadcasted live by Channels Television on Monday (February 11 2019). In the video which has now gone viral, the viciously angry Amosun was seen walking angrily towards Aregbesola to attack him but his wife followed suit while pulling at his agbada and speaking to him to come back. Governor Amosun who seemed very fond of his wife, turned aside from his intended attack on Aregbesola and went back to his seat. True love. I like his wife though. The end of the Asiwaju hegemony is near! The nail in the coffin will come after defeat of the incompetent Buhari administration. He said come d day of governorship election you all should vote for APC.the statement which didn't go down well with the governor bcoz his preferred candidate is not in APC but in APM another party d gov created.